The number of smartphone users worldwide, which has been sharply growing for over a decade, is expected to pass the five billion mark in 2019, and use of social media platforms has also skyrocketed. 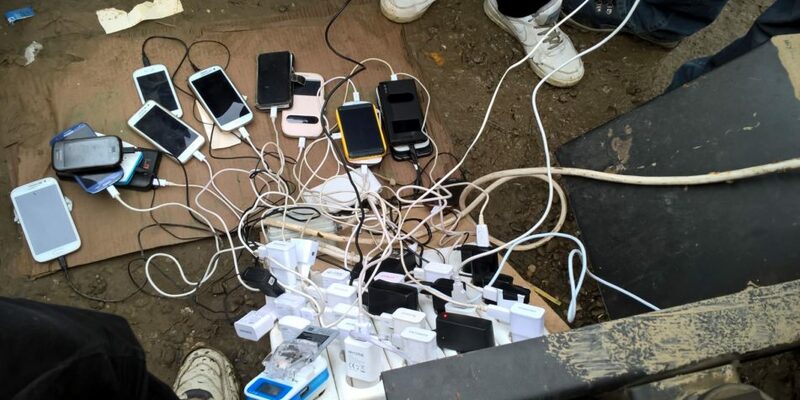 Supported by all the images and reports on refugees and migrants navigating their way through Europe in 2015/2016 by using Facebook and Google Maps on their smartphones, this has created a public impression that almost all people on the move are in possession of a smartphone and using apps. To what extent is this supported by empirical evidence? This article analyses new evidence from 10,060 interviews conducted between May 2017 and October 2018 along seven major migration routes in Africa and Asia, to understand if smartphones and social media are as widely used by refugees and migrants on the move as commonly believed. It also provides some examples of the various ways smartphones and social media are used in mixed migration, both by people on the move, smugglers and authorities, and why they can be essential tools to reduce reliance on smugglers and reduce the risks and vulnerabilities faced by people in mixed migration flows. The recent case of the 18-year Saudi women Rahaf Mohammed Alqunun, showed the power of social media. After she fled Saudi Arabia and was on her way to Australia, she got stuck in Thailand. She locked herself up in a hotel room at the airport in Bangkok and launched a campaign on social media. She registered a Twitter account and started posting videos. Within minutes, her tweets were being re-tweeted around the world, and she caught the attention of activists and Human Rights Watch. Within 24 hours, the #SaveRahaf had been used half a million times and she got 170,000 followers in just over week. UNHCR intervened and she was flown to Canada, which offered her asylum. This example shows that, on the one hand, the power of social media cannot be underestimated. There has indeed been an exponential growth in use of social media in irregular migration over recent years according to a 2018 Europol report. The findings of this report are supported by research conducted with recently-arrived asylum seekers throughout Europe: Dutch researchers found that the vast majority of Syrians who travelled to the Netherlands used smartphones and social media to facilitate their movement across borders; a study at Berlin’s Freie Universität revealed that mobile phones were central tools during migration journeys to Germany of refugees from the Middle East and Central Asia and that Wi-Fi hotspots were as necessary as water points. The Peace Research Institute Oslo referred to the emergence of the Digital Refugeein recent years, with internet communication tools becoming a key characteristic of mixed migration flows. Media reports have also documented how refugees and migrants crossing the Mediterranean Sea to Europe on rickety boats had ready SOS messages with exact GPS position to send out if they get lost and used their phones to call for rescue. Social media can also be used by authorities for migration control purposes. Authorities – particularly in Europe – are increasingly extracting smartphone data (such as messages, location history and even WhatsApp chats) to verify the identities of asylum applicants and decide whether they qualify for protection. Legislations permitting hacking phones of asylum seekers were adopted during 2017 in Belgium, in Norway, and in Austria, while in the UK this practice has been permitted since 2013. In Denmark, where these phone searches have also been happening, asylum seekers have been asked by asylum officials to provide their Facebook passwords so that their social media profiles could be examined. In 2017, after Germany made it legally possible for migration officials to extract data from asylum seekers’ phones, more than 8,000 phones were searched in about a half a year. There is also a high prevalence of misleading and untruthful migration-related information available on social media. Trusting smugglers that advertise their business on social media is risky because they downplay the difficulties of the journey and create unrealistic and misleading rumours. During 2015 and 2016, as mixed migration to the EU was peaking, some refugees and migrants seeking information online were tricked by people posing as smugglers, and misleading migration routes were published on Facebook. On some smugglers’ social media the logo of the UNHCR was misused to deceive potential clients. Several international non-governmental organizations have created internet applications that provide refugees and migrants information sources that are more reliable than social media. The MigApp, created by the International Organization for Migration, offers comprehensive information on the risks of migration, visa regulations and government policies, as well as access to migration services and programmes. The International Rescue Committee created Refugee.Info to provide refugees and migrants with credible, up-to-date, relevant information in six different languages on needs such as legal rights, transportation and medical services. The Red Cross and Red Crescent societies created Trace the Face, an internet platform that makes it possible for refugees and migrants to find missing relatives and friends. These tailor-made digital tools enable access to valuable information and services, but research shows refugees and migrants tend to be reluctant to turn to NGOs for migration-related information; the UNCHR found that majority of Afghan and Arabic refugees and migrants ignore institutional websites unless links reach them via Facebook, and 4Mi data as presented below indicates that information provided by authorities or by NGOs is hardly ever the first source of information for people in mixed migration flows. The use of smartphones and social media: what do the data tell us? Clearly, there is still a digital divide – a disparity in access to smartphones and social media – across regions. Data from the Mixed Migration Monitoring Mechanism initiative (4Mi), based on a large sample 10,060 interviews with refugees and migrants on the move along 7 different migration routes, provides further and more evidence-based insight into the use of phones and role of social media by people on the move. Although a large majority of 80% indicates they had a phone with them during their journey, less than half (43%) had a smartphone. People on the move from the Horn of Africa towards Yemen and Saudi Arabia report the lowest ownership of phones, with only about half of the people owning either a phone or smartphone. This fits with the profile of people on the move on this route. On average, 4Mi data shows they received less education and more often come from rural, pastoralist backgrounds, compared to some of the other routes which see a larger proportion of young, technologically connected and better educated people from urban areas. The 4Mi data indeed shows that the higher the level of education, the more likely it is people had a phone with them on the migration journey. A 2016 UNHCR report identified how smugglers post on Facebook their proposed migration routes and prices along with contact details, and when potential clients post questions they are instructed to use direct communication lines such as WhatsApp or Messenger. “Smuggling Into the EU”, “Smuggling from Turkey to Europe”, and “Wishing to immigrate to Europe through Libya” are a few of many Arabic-language Facebook groups that served people in mixed migration flows, according the Political and Social Research Institute of Europe. A 2016 paper by the Mixed Migration Centre (then RMMS), also provided examples of how Facebook facilitates contact between smugglers and migrants and provides information about suitable destinations. MMC also directly interviews smugglers as part of 4Mi. 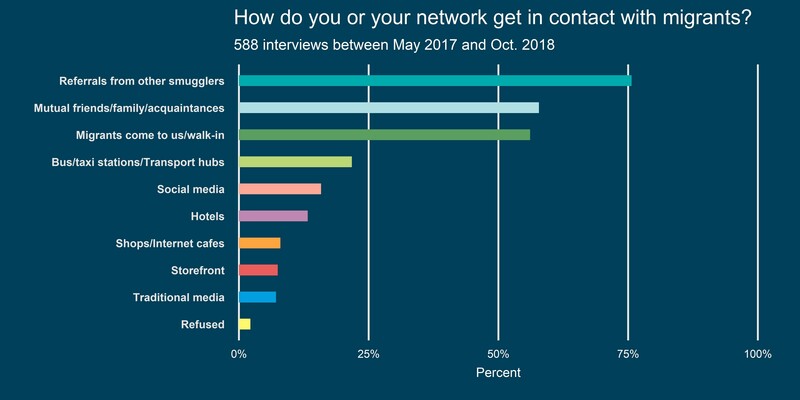 The analysis of 588 interviews with smugglers between May 2017 and October 2018, suggests that social media are less important for smugglers to get in touch with migrants and as an enabler for their business than generally assumed, or portrayed in the many media articles on the subject. The first graph (graph 2) below shows that smugglers primarily get in contact with their clients through referrals from other smugglers, through friends, family and acquaintances, or that migrants simply come to them. Social media is quite far down this list. In terms of means of communication between smugglers and migrants, as graph 3 below shows, by far the most common are mobile phone calls, followed by WhatsApp and Facebook. Social media does not play a major role in influencing people’s decision to migrate. On average, across all surveyed migration routes, only 7% of respondents say social media influenced their decision to migrate. 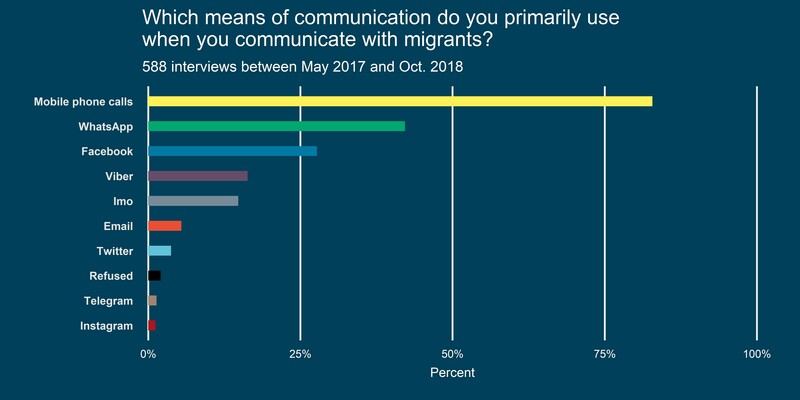 Similarly, social media does not appear to be an important first source of pre-departure information on migration for future migrants in countries of origin (18% across routes; see graph 4 below). The most important sources of information on migration along all routes are friends and family in countries of destination, smugglers, or friends and family in countries of origin (49%, 34% and 28%). However, actual use of social media to get this information could be higher than recorded by 4Mi, as social media (including for example Facebook) may not be the source of information, but may very well be the means to communicate with the source of information, in this case friends and family. Interestingly, some of the channels/sources that are commonly used in information-campaigns – for example on the risks of migration – such as signboards, leaflets, websites and UN and NGOs – rank lowest among the first sources of information. While on the move, respondents indicate that smugglers are the most important source to access information (52.9%; see graph 5 below), which signals a large reliance on smugglers (see below). This is followed by “calling others ahead of us” – which underlines the importance of having access to a phone – and friends and family in countries of destination. There is some variation on different routes. For example, for respondents from West Africa interviewed in Mali and Niger (‘indicated as West Africa to Sahel’ in the graph below) smugglers are a less important source of information. Movement within this region falls within the ECOWAS free movement which makes the use of smugglers less necessary compared to the other routes. Almost half of the 10,060 respondents (47%) indicate they do not use social media while on the move, with only Afghans reporting slightly higher usage of social media. In cases where people do use social media, Facebook (mentioned by 41% of respondents), WhatsApp (38%) and Viber (22%) are the most commonly used along all routes. Between 80-95% of respondents indicate they primarily use social media to communicate with friends and family (91%), followed by ‘accessing information’ (58%) and ‘to communicate with smugglers’ (44%). Most of the data above shows that the reliance of both smugglers and migrants on social media should not be overestimated. 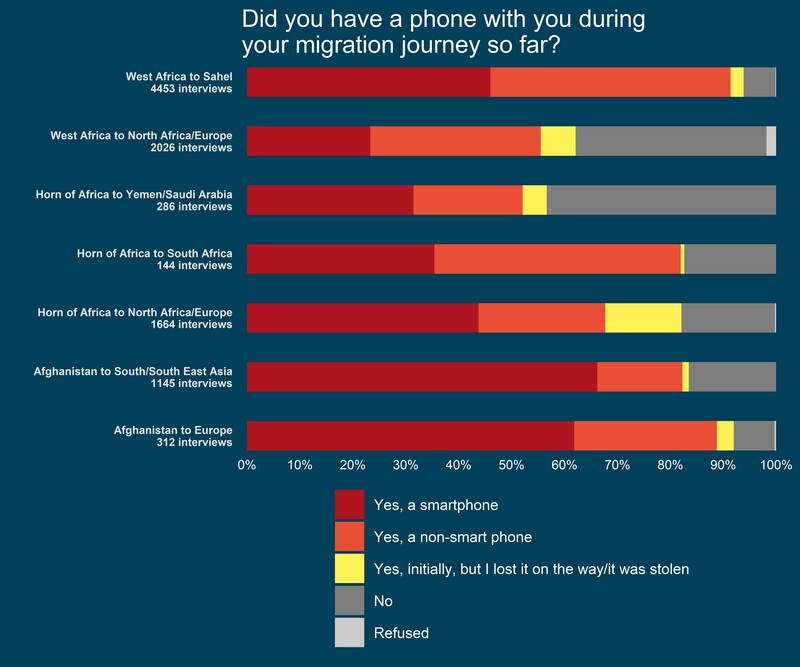 However, graph 6 below does show how important it is for refugees and migrants to have a phone with them. Those who have a phone with them, rely on a wide range of channels to access information during the journey, including friends and family (both in country of origin and in destination), calling others on the move, as well as social media. Those without a phone primarily rely on smugglers as the main source of information. Taking into account that 4Mi data also shows that smugglers are the main perpetrators of violence towards migrants and many feel intentionally misled by their smugglers, a strong reliance on smugglers leaves refugees and migrants particularly vulnerable. Considering the growing global outreach of smartphones and social media, it is likely that the role of these digital communication tools in migration journeys will continue and further increase. This has the potential to transform the way mixed migration journeys are planned and undertaken, and it is therefore important that the role of smartphone and social media is better assessed and understood. This article shows that social media can empower refugees and migrants and enable them to make their voices heard, as proved by the emblematic recent case of the 18-years old Saudi woman Rahaf Mohamed Alqunun. (Smart)phones and to a lesser extent social media can also be valuable tools to make people on the move less vulnerable, as the analysis of the 4Mi presented above suggests with regard to reliance on smugglers. However, contrary to the common belief, this article also showed that still less than half of a large sample of more than 10,000 people on the move had a smartphone with them. This could be an important consideration in the planning of protection responses for people on the move. Offering them greater access to smartphones and internet could go some way to reduce vulnerabilities, at least with regard to the reliance on smugglers, although of course that are many other factors that contribute to the vulnerable situations that migrants end up in. 4Mi data, however, also shows that reliance on smartphones and social media should not be overestimated. This seem to be particularly the case when it comes to the role of phones and social media in influencing migration decisions in countries of origin. This could highlight some of the limitations of awareness campaigns conducted predominantly through social media. Smartphones and social media in mixed migration, hype or hope? The answer is, a bit of both. They can become increasingly important tools, reducing reliance on smugglers and empowering refugees and migrants. However, the data also shows that many people on the move, both before and during migration, still rely on more traditional sources and means of communication. The graphs in this article present the 4Mi data according to the route on which the respondents were interviewed. Sample sizes vary considerably between routes and are indicated in the graphs. Percentages provided in the text referring to an average across all routes account for the different sample sizes per route. The routes are assigned as follows: Afghanistan to Europe: interviews with Afghans in Denmark, Germany and Greece; Afghanistan to South/South East Asia: interviews with Afghans in India and Indonesia); Horn of Africa to North Africa/Europe: interviews with Somalis, Eritreans and Ethiopians in North Africa and various European countries; Horn of Africa to South Africa: interviews with Somalis, Eritreans and Ethiopians in Kenya, various Southern African countries and South Africa; Horn of Africa to Yemen/Saudi Arabia: interviews with Somalis, Eritreans and Ethiopians in Djibouti and Somalia; West Africa to North Africa: interviews with nationals from a wide range of West African countries in Libya; West Africa to Sahel: interviews with nationals from a wide range of West African countries in Burkina Faso, Mali and Niger.